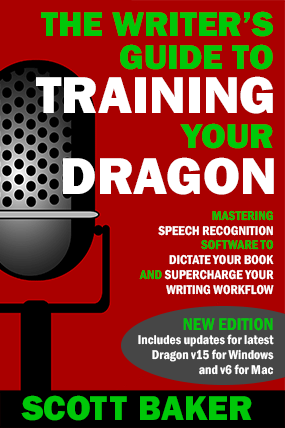 TRAINING YOUR DRAGON with SCOTT BAKER – Page 4 – Author of "The Writer's Guide to Training Your Dragon"
Dragon requires programs on the Mac to grant it Full Text Control – not a problem in TextEdit but a nightmare in, say, Scrivener. This video shows you how to deal with these issues and stop your cursor going crazy when making corrections. Smartphones are terrific for recording audio files anywhere that can be transcribed later. The problem? Some built-in mics are patchy and high-quality external headsets guaranteed to be compatible are hard to come by. The solution? Use a USB mic or headset. This can be handy if you already use a quality USB mic and want to take it with you on your travels. With an OTG cable or Lightning Adapter, you’ll be transcribing with your smartphone at sky-high accuracy levels in no time. Time for Day 2 of “7 Days of Dragon Tips”! If you write Fantasy, Science Fiction or any genre that involves complex character or place names, how do you get Dragon to insert them correctly every single time? This tip shows you how. 7 Days of Dragon Tips – Day 1: Should I Use a Bluetooth Mic with Dragon? Welcome to Day 1 of “7 Days of Dragon Tips”! Bluetooth microphones are compact, convenient and extremely portable. They free you from messy wires and big, bulky headsets so, in theory, they should be a dream come true for using with Dragon. Right? If you’ve read my book “The Writer’s Guide to Training Your Dragon“, you’ll know the answer is ‘probably not’. I don’t generally recommend using Bluetooth headsets with Dragon and, in the video above, I explain why. Don’t get me wrong – there are some exceptions. Sennheiser make a number of excellent Bluetooth headsets that work very well with Dragon (links below for those interested) but they work best when using the ‘Far Field’ algorithm that needs to be manually selected when setting up a Dragon profile. One issue with this? It only works with North American accents. In short, unless you desperately want to use Bluetooth for some reason, you may be better off sticking with a much cheaper (and probably better performing) wired headset. Check back tomorrow for another tip! 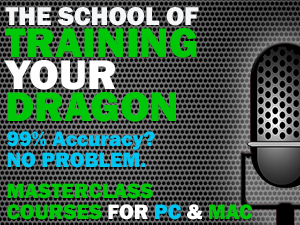 Author Scott BakerPosted on May 13, 2016 September 22, 2016 Categories Dragon, Microphones, Tips and TricksTags Bluetooth, Mac, Microphones, Naturally Speaking, PC, WirelessLeave a comment on 7 Days of Dragon Tips – Day 1: Should I Use a Bluetooth Mic with Dragon? A New Dragon Guide – FREE! NOTE: This book is currently only free for Kindle customers at Amazon in the US and UK. I cannot control this as Amazon sets price matching for international stores at their discretion. 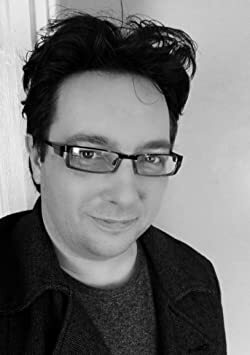 Readers outside the US can get a free Kindle version of the book at Smashwords and load it to their Kindle device using this link. Author Scott BakerPosted on April 5, 2016 May 14, 2016 Categories Dragon, EbooksLeave a comment on A New Dragon Guide – FREE!